If you have diabetic retinopathy you may need to see a specialist eye doctor (an ophthalmologist) for ongoing care. Treatment doesn't cure diabetic retinopathy, and it doesn't usually restore your vision to what it was before. However, it can slow down the damage and stop new damage from happening. It is very important that you get good control over your blood sugar, as this can reduce any further damage. If diabetic retinopathy is threatening your vision, laser treatment may be an option. 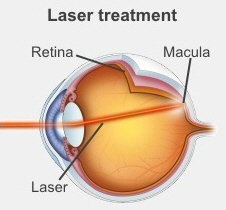 The laser can treat just one spot, such as the macula. This is called focal laser treatment. Or it can be used more widely in the retina, to help slow or stop any further damage. This is called panretinal photocoagulation (pan-re-tin-al foto-co-ag-u-lay-shun). Medicines such as Avastin (bevacizumab), Lucentis (ranibizumab), and Eylea (aflibercept) can help to reduce the growth of abnormal blood vessels and reduce the amount of fluid leaking from them. These medicines can be injected into your eye, after it is numbed with local anaesthetic. This treatment is especially useful if the retinopathy is affecting your macula – the part of the retina that is responsible for fine, detailed vision. You may have just one injection, or you may need several injections. This treatment can only be done by ophthalmologists (eye doctors) in their clinics. This video from the Canterbury DHB Eye Outpatients Department shows a patient's experience with eye injections. Note: The video shows a person having injections in their eyes and some people might find this disturbing. Some people with advanced diabetic eye disease and severe loss of vision need retinal surgery. If you have this surgery, you may need to stay in hospital overnight. More information about treatments for diabetic retinopathy, including short, animated videos. On the next page: How can I look after my eyes? Written by Canterbury optometrists. Adapted by HealthInfo clinical advisers. Endorsed by clinical director, Ophthalmology, Canterbury DHB. Last reviewed October 2017.